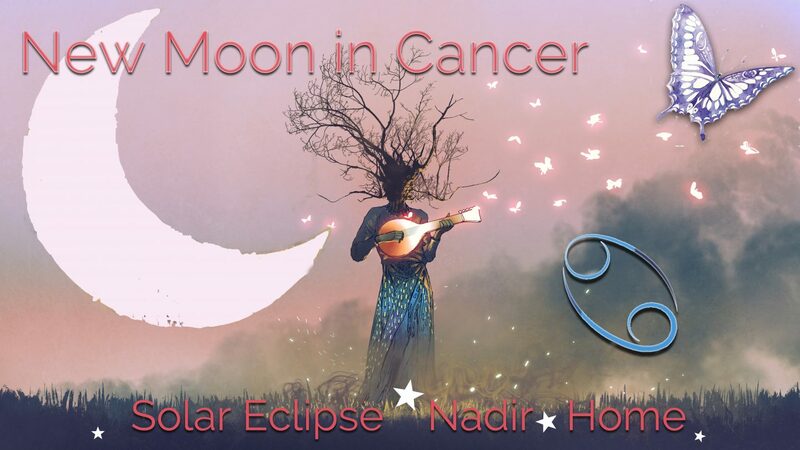 New Moon Solar Eclipse in Cancer July 13, 2018: Connection! Connection! Get your Fresh, Hot Connection! ★ Do the one-day New Moon in Cancer Ritual any time between July 10th and July 20th for the best effects. The New Moon rises in Cancer on July 13th at 4:47am CEST. ★ Are you ready to step into Butterfly Badassery? Then join Badass Butterfly’s Master Manifestor Coaching & Mastermind program. The program launches September 1st, so sign up to get updates and learn how you can participate in the pilot program! Note: This report contains an exercise that will raise your vibration. Enjoy! As the Sun makes its way around the Zodiac, all of us are presented with a new opportunity for growth and development. The Sun’s energy has direct influence on our outward expressions. Have you ever noticed that you feel particularly good in March? Or more inspired in November? Very often we attribute these mood shifts to the seasons, but I would like to suggest that you are responding at least as much to the Sun’s influence as to the weather’s. All the celestial bodies exert their influence as they orbit the solar system. As Venus navigates the signs, she’s influencing our sexuality, our desire, and our creativity. As Mars makes his way, we may find ourselves energized in our body, spending money more freely, or exhibiting a short temper. As the Sun progresses through the Zodiac, our personality is greatly affected and takes on the characteristics of the sign and house he is occupying. Around the 18th to the 21st of each month, you can start observing how you feel to see if you can notice the shift. Personally, when the Sun moved from Gemini into Cancer on June 21st, it felt like a real blessing because it unleashed a powerful awareness of my emotional self. Deeply buried feelings have been revealing themselves to me for further exploration, reparation and integration. While the Sun was in Gemini, my mind was light and I could barely keep my feet on the ground. I was Effervescent Badass Butterfly lighting gently on the daisies. The moment, though, the Sun hit Cancer, I became grounded and more deep in my feels. Today, I am Emotionally Aware Badass Butterfly. Personally, I LOVE this Sun transit because I am Aquarius and my nature is air, meaning that I experience the world through my mind. Aquarius is mostly on the outside happily viewing the world like a scientist views an experiment. Curiosity is my driving force. Cancer, though not the opposite of Aquarius, is definitely on the other end of the spectrum. Cancer is a water sign, ruled by the Moon, making it feminine, receptive, and experiencing the world through the emotions. With the Sun in Cancer, we are all more feeling-oriented. Connection is the driving force of Cancer, and this is the big opportunity that comes with the Sun transit and the New Moon Solar Eclipse is bringing. In this modern world where we are highly connected through technology, we can find ourselves disconnected emotionally. The more dialed in and connected we are to our apps and devices the more isolated we are from the little instances of human interaction. I had dinner the other night with several girlfriends and their children and while we adults were free to enjoy uninterrupted adult time, most of the kids were in their individual worlds with their iPads, not disturbing us, but not interacting with one another either. I found it to be a bit disturbing, but I couldn’t cast judgment because I benefitted too much from the kids’ preoccupation! I did, however, come home and cancel my Netflix account and I have decided (especially since I am getting more grounded and less nomadic in Italy) to stop using iBooks and Kindle and to start investing in paper books again. I have never liked reading on a device and only tolerated it because I traveled. Now that I’m settling down into the farmhouse lifestyle, I’m buying me some books! Cancer makes up the 4th house of the Zodiac and here are governed all things of the nadir. In everyday terms ‘nadir’ means ‘the lowest point.’ In astrology, it means the point below the observer. The nadir is everything that makes up your emotional self. It is your collection of things that grow you. In this realm comes your home and family of origin, your childhood experiences, how you were nurtured (or not) your relationship with your mother, and your karma. This 4th house gives clues to the well-being of your Inner Child. This is a special New Moon in Cancer because it eclipses the Sun by 20 degrees. Eclipses add another level of depth to the Moon phase. The Sun represents masculinity, reason, directness, and consciousness. When the Moon eclipses it, the idea is that the feminine, raw, wild self is coming forth to deliver the culmination of past thoughts and behaviors. Eclipses are a time of reckoning and they usually herald some kind of big shake up. None of the subsequent fallout should be surprising, though. You can see and feel it coming. If you’ve been listening to the subtle murmurings of your body and your intuition, then you will. If you feel a bit lost or clueless to these feelings, don’t worry. Just be aware that something is there and start tuning in now. Take one minute three or four times a day and just pause and stand still in the silence and see what arises into your consciousness. Over the course of this Moon phase you just might feel the femininity, intuition, indirectness and the unconscious mind moving to the forefront. Home (your physical living space.) The nature of Cancer tends toward security. Cancer is represented by a crab—a soft being with a hard shell that protects them. Cancers are naturally good at setting up house and their nurturing way of being extends into an inviting coziness. They give warmth and hospitality to all who come through their door. You feel like you have been invited into a safe haven when you enter the space of Cancer—whether it be their physical home or their work space or just their presence. With the New Moon Solar Eclipse in Cancer, we are presented with an opportunity to make our home cozy, comfy, and a center for retreat and safety. During these next several days, you might enjoy sprucing up your space with some comfy throws and maybe a new pillow or two. You may find yourself lighting candles, burning incense and warming up your environment. These are some very basic things you can do to invite more comfort and grace to the home space. Don’t hesitate to invite friends, have a party and celebrate with some fun. And remember to take the feeling of home with you wherever you go. Home is where the heart is and your heart goes everywhere—even to the grocery store! You could also literally consider home security right now. If you feel an impulse to secure your home with an alarm or security system, this is a great time to start looking at different options and getting some quotes. As we are in the Shadow phase of Mercury Retrograde, I suggest you don’t actually invest or commit to a security system contract until after August 19th (maybe even holding off until August 27th if possible) since it is inadvisable to sign new contracts during the retrograde period. You can do it, if your instinct says to do so (ALWAYS take responsibility and follow your instinct) but don’t be surprised if you find yourself having to renegotiate the contract. I’ll talk more about Mercury Retrograde in another report. Nadir. Cancer rules the 4th house—the house of Mother, home, the emotional self, nurture, and nadir. In astrology, the term ‘nadir’ refers to the point just below where you are. The point just above where you are is called the ‘midheaven.’ So, in the natural astrology wheel, Cancer rules the nadir and Capricorn rules the midheaven. Midheaven is what you give to the world. It is your achievements and the world’s response to what you put out. Nadir is your most intimate and private self. It is the home of home—the root of your being. It represents your deepest emotional needs. And ooooh, honey, this is why the Sun in Cancer transit can hurt so bad. With this New Moon Solar Eclipse in Cancer I want you to take plenty of time to focus on what is bugging you. Now, I know that we normally do Shadow Work with the Full Moon and Light Work with the New Moon, but this is Cancer we’re talking about. Every day is a good day to explore Shadow when we have a Cancer transit! So, I’m going to give you a VERY powerful way to touch on the issues at your nadir and totally shift your vibration naturally… gently. 1. Mean dogs when I’m walking Apollo in the dog park · I desire to walk Apollo with confidence and find ourselves encountering fun and well-behaved dogs that reflect Apollo’s good nature. · I desire to trust the natural protection that comes along with knowing the Divinity of all things. · I desire to feel connected to the Divine. 2. Falling asleep when I am writing something difficult to communicate · I desire to stay awake and present through all the different parts of the writing experience. · I desire to embrace writing challenges with sincere appreciation of the full spectrum of experiences. · I desire to be true to the inspiration that comes through me and to nurture myself as a writer and channel of the Divine. The next thing you must do after completing the columns is look for evidence of your clarity column in your life NOW. For example, as I am writing this, I am noticing that I have a strong desire to stay awake and present. I feel true to the inspiration coming through me. I am feeling confident and I am appreciating the Divine around and inside me. The key, though, is to keep this up all day and then the next day, too! Your vibration will change immediately, but it’s up to you to maintain the momentum of your positive thinking. It is up to you to stay focused on what is helpful and serving your joy. It is also always up to you to master your focus. Keep your list near you for the next week—in fact, all through the New Moon phase. This exercise is powerful because the contrast in column 1 was inside me working quietly on my subconscious mind. Those things are rooted in my nadir, my emotional baggage (ie not trusting the Divine and checking out when the going gets tough.) By vocalizing these things that were quietly bugging me, I first (got them off my chest) and second, made my mind focus on what I desire instead of what I don’t want. These two things are game changers in the Law of Attraction and this is exactly the kind of thing you want to do with the New Moon Solar Eclipse in Cancer. The Solar Eclipse aspect of this Moon phase means that we are able to eclipse or edge out something big, hot and oppressive that is holding us back. Isn’t the contrast of column 1 the perfect thing to release right now??? And since the New Moon prescribes that we focus on what we do want for ourselves, isn’t it perfect that we now have a positive focus? When I did this exercise, it felt amazing! I instantly felt my resistance lowering as I started thinking about what I desire. I hope you like this exercise. I learned about it from Michael Losier, a Law of Attraction and Emotion Code Coach. Going with the flow. Cancer has a sense of ease and flow about their being. The thing is, Cancer is ruled by the Moon and the Moon changes sign every two days or so. This means that Cancer is at ease in the natural cycle of life. Oh, they may not change home or jobs very often. But the subtle energy shifts that occur from day to day don’t ruffle the feathers of the Cancerian (or should I say ‘disturb the shell of the Cancerian!’) Our opportunity with this New Moon Solar Eclipse in Cancer is to relax the mind and slip into the feeling, intuitive energy in the body. Practice sitting back and allowing the world to flow around you, flow through you. Let this be your meditation. Let this be your practice while you drive, while you work… see what happens when you let go and let Goddess. Connection. The powerful gift of connection comes from Cancers ability to have everything it needs in its container. As we have seen, home is an integral part of Cancer’s being. Contrast this with Pisces who is also a water sign but finds itself like a fish out of water here in the 3-d earthly plane. The nature of Pisces is to be beyond the veil, in the realm of the mystical. Cancer is a water sign who is always at home on Earth because she is self-contained. The opportunity with this New Moon in Cancer is to explore how to feel connected everywhere all the time. Personally, I would explore themes around belonging, intimacy, trust, and generosity. Diving deep into these things will help open you to feelings of connection. Feel free to do your own personal explorations in your journal or check in with me for a professional Tarot reading if you want to go deep into any concept. Feeling good in your body. The last thing I’m writing about is feeling good in your body. Take the New Moon Solar Eclipse in Cancer opportunity to connect with your body, celebrating the fact that you are alive and have cells! Dance a little. Make some love. Enjoy a delicious meal. Cancer loves its pleasure and the opportunity of this New Moon is to delve into your carnal desires—give into your passion. You need that, Badass. And that is that! By the way, my friend, please remember that the Completion Process is a powerful healing technique for the Inner Child originated by spiritual teacher Teal Swan. I was among the first to be certified in it and I have incorporated it to my coaching program. If you feel like you want to experience this service, then book yourself in directly. If you have any questions about it, check it out on my website. There’s also a video of Teal taking me through the process personally. Alright, my beloved Badass Butterfly! That’s it for now. Remember to sign up for the Monthly New Moon Ritual and join me at the top of every month on the first Saturday for Spiritual Guidance for the Badass Butterfly: A Monthly Gathering. Previous Post Tarot Forecast for July 2018: Get whole NOW!